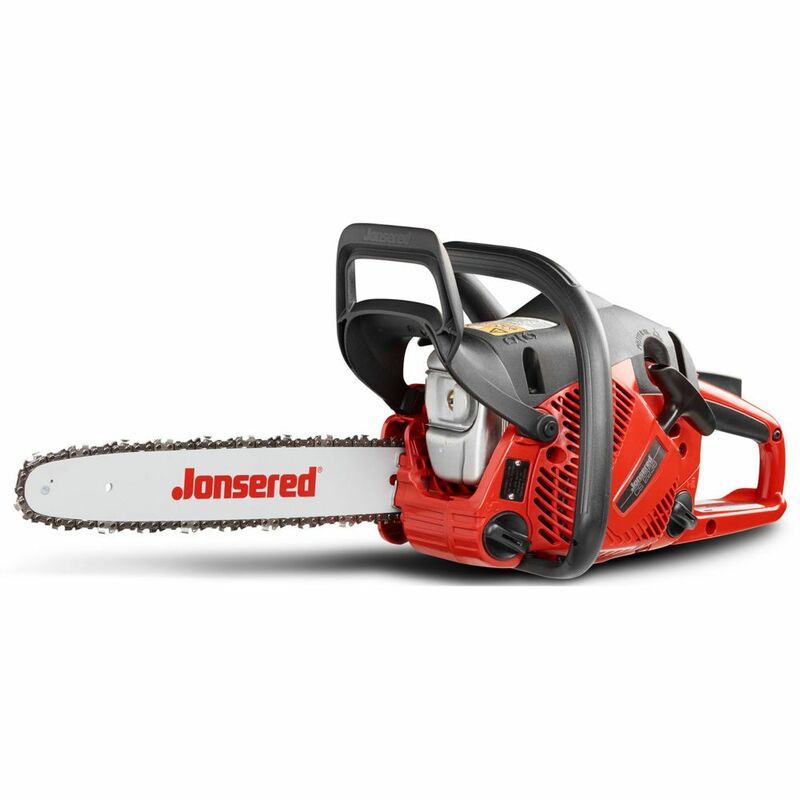 Ideal for occasional and part-time homeowner use, the Jonsered 2238 gas chainsaw is perfect for cutting firewood and pruning or felling small trees. Our patented Clean Power engine technology is powerful and environmentally friendly, reducing harmful exhaust emissions up to 75% and increasing fuel efficiency up to 20%. Unique turbo intake air cleaning technology separates and removes up to 97% of sawdust and other dust particles from air before it reaches the air filter, providing optimal performance with less frequent filter cleaning. This user-friendly, lightweight chainsaw also features Jonsered's Anti Vib. technology for vibration dampening and reduced operator fatigue on long work days. This Blue Max 14-inch electric chainsaw is easy to manoeuvre around tight spaces, giving you the ability to trim small shrubs. The powerful motor's 3500 RPM makes cutting tasks go quickly and the mechanical brake system stops the chain from moving in 0.1 sec. for safety. The auto lubrication oil system with oil level window for easy viewing means less maintenance. Make quick and easy tension adjustments with the tool-free chain tensioner. The DEWALT DCCS620B 20-Volt MAX batteries. Gas-free operation eliminates the cold starts, fumes, carburetor issues, and maintenance involved with gas-powered chainsaws. This battery powered chainsaw is built to work hard. Use it for tough construction and outdoor jobs like cutting beams, demolition work, and managing tree limbs. The lightweight design maximizes user control. Brushless motor technology delivers extreme runtime and long motor life. The EGO Power Chainsaw truly delivers power beyond belief. The 14-inch bar and chain, combined with a high-efficiency brushless motor, provide smooth cuts. The brushless motor extends the life of the tool and the run time. The advanced EGO POWER+ 56V battery uses industry-leading Arc-Lithium technology to deliver robust power and is compatible with all EGO POWER+ products. The EGO POWER+ Chainsaw delivers the performance of gas without the noise, fuss and fumes. 38cc 14 inch Gas Chainsaw, CS2238 Ideal for occasional and part-time homeowner use, the Jonsered 2238 gas chainsaw is perfect for cutting firewood and pruning or felling small trees. Our patented Clean Power engine technology is powerful and environmentally friendly, reducing harmful exhaust emissions up to 75% and increasing fuel efficiency up to 20%. Unique turbo intake air cleaning technology separates and removes up to 97% of sawdust and other dust particles from air before it reaches the air filter, providing optimal performance with less frequent filter cleaning. This user-friendly, lightweight chainsaw also features Jonsered's Anti Vib. technology for vibration dampening and reduced operator fatigue on long work days. 38cc 14 inch Gas Chainsaw, CS2238 is rated 3.1 out of 5 by 12. Rated 4 out of 5 by HomeDepotCustomer from Saw runs well but wasn't user friendly for adjusting idle... Saw runs well but wasn't user friendly for adjusting idle and hi speed. The average DIY would require special tools or take it to a service shop. Rated 5 out of 5 by kidkirb from Great running saw, light weight and easy to use. Great running saw, light weight and easy to use. Rated 4 out of 5 by NOTPERFECT from GOOD PRICE FOR HOME USE IT'S BEEN A GOOD LITTLE SAW .HOWEVER, THE TENSION SCREW DOES NOT WORK VERY WELL . THUS, THE CHAIN COMES OFF EASILY. Rated 5 out of 5 by DMAR from Fun little saw! I actually won this little saw during a fundraiser for an animal shelter in my little mountain town. I had never even heard of Jonsered chainsaws, but I was excited to win it. Well, I've been using it pretty hard for the last few months. I've run it probably 50 times. So far, I'm really impressed. The aspen trees grow like weeds where I live at 9,000 feet in the Colorado rockies. I live on 2.5 acres. I do A LOT of tree work. I also help my neighbors do a lot of fire mitigation work. I like to use this nice little saw for cutting down and cutting up the smaller dead aspen trees. I have a much bigger competitor brand saw that I use to knock down and cut up the huge douglass fir trees and ponderosa pines. But my big saw will absolutely wear you out limbing the big trees with it. This little Jonsered is perfect for limbing the big trees once I cut them down. It really makes the job go much faster using this much lighter, more agile saw for limbing. It's easy to start and it has a lot of power for a little guy too. I'm impressed with the Jonsered. If it holds up over the years, I'd definitely buy another one. Rated 5 out of 5 by UberSaw from Much more than expected. I've always used professional-grade saws, so when my wife bought me this little Jonsered as a gift I was skeptical of what to expect. I've been very pleasantly surprised with my CS2238. It starts easy and has been my go-to saw for jobs around the yard, especially with light storm and wind damage. I'm very impressed, especially for the price. Rated 1 out of 5 by gah170 from Ran great cut like a champ for 10 minutes... first time i used this thing it ran great for about 10 minutes then the chain jumped and got destroyed. i want to my local big box hardware store for a new chain. i installed it and it ran great for just another 3 cuts before the chain jumped again. upon further inspection i found that the retainer for the tensoiner is a plastic tab about 1/16" thick and it had broken causing the bar to move and chain to fall off. Rated 5 out of 5 by azcarver from love this little beast I've used this machine hard for a year now. Bought it at Tractor Supply. It's a little beast. We live in the Arizona and heat our home in winter with a wood stove. I'm cutting hard dry mesquite wood pretty much exclusively. My other chainsaw is an Echo. This Jonsered machine feels more solid and I prefer using it. No trouble starting it or keeping it running. The negative reviews I read seem absurd to me, but I guess everyone has their experience to put out there. I love this saw and would definitely buy more in the future.